Now that all the arrangements for the wedding, the reception, and the honeymoon have been made, you need to ensure that you have an album full of superlative photographs that will keep reminding you of this great occasion even many years down the line. Selecting a good wedding photographer can be quite normally quite difficult, but the following tips, hopefully, will take out much of the hassle. The first thing that should concern you when trying to choose a wedding photographer is the quality of the photographs. The hallmark of a good photographer is his ability to offer a number of styles to his clients, his competence in capturing the couple’s personalities, and translating the fun and the joy of the event to the photographs. If you are unsure of the style you prefer, ask the photographer to explain, and show you examples. If you really like a photographer, ask to see the entire album and not just a selection of the best photographs he’s picked out for you. This will help you to make sure that the quality of his photography is consistent. You should know that almost all the photographs you are being shown are edited to a certain degree. See if the photographer is consistently trying to cover up for poor quality with generous dollops of editing. The real test of the quality of the photographer is his ability to shoot pictures that are natural and tell a story well about the couple. 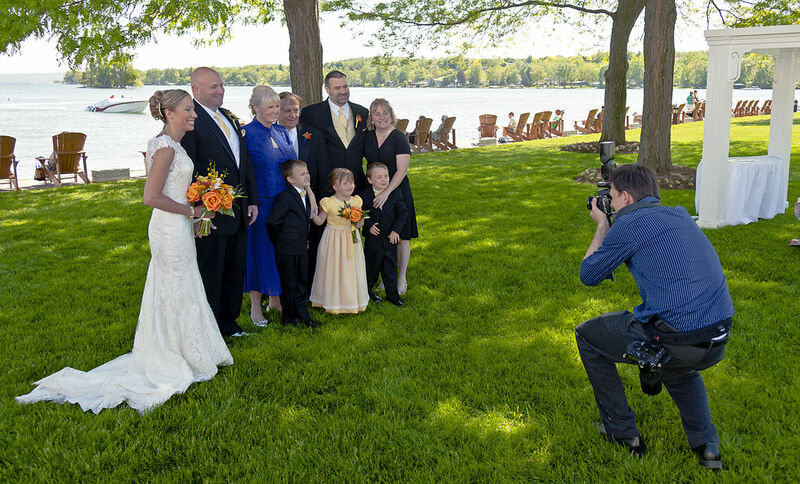 By assigning the wedding photography, as a couple, you are reposing a lot of trust in the photographer regarding his ability to capture a true and natural account of what is the most important event of your lives. It is very important that the photographer is not only capable and confident but also has the ability to put you at ease. Usually, within the first few minutes of your interaction, you will be able to know if you are comfortable with the photographer and he will be able to get the best out of you. Regardless of how competent he is if you feel he is going to be difficult to work with due to his attitude, it is best that you look for alternatives. Remember, your guests too will be at ease if the photographer is friendly, approachable, and has a down-to-earth manner. This will create the perfect situation for shooting photographs that look natural and not forced. Often, the real criterion for selecting a particular photographer over others is the cost. Though it should be an important consideration, it should not be the basis on which you make the decision. Big-shot professional photographers do tend to cost a lot but you can get equally good images from those who are more reasonably priced. What you do need to be very clear about are the terms of the engagement so that you know exactly what impact the decision has on your budget. Insist of a clear, unambiguous, and transparent pricing policy from the photographer so that you do not end up in disputes at a later stage. Professional photographers will invariably offer you a choice of packages with different scopes of supply and price tags. If you need him to design a custom package for you, be clear about what you want and expect. Make it a point to ask about hidden extras, such as editing, album artworks, taxes, and even reimbursement of expenses on travel, lodging, and food. Ensure that you get a written quote to prevent any misunderstandings. It is a good idea to engage photographers who have prior experience of shooting weddings at that venue. However, in case, he has not worked at that venue earlier, he must be willing to reconnoiter the place to establish the best locations, movement of the sun, as well as interesting backgrounds. Someone with lots of wedding photography experience will always want to meet the groom and the bride, as well as important family members so that he knows who his more important subjects are, and what their expectations are. You will know he is serious about his work if he asks for a minute-by-minute schedule of the wedding. Nicholas Warren, a professional photographer, teaches photography at leading private institute. He writes on a wide assortment of photography subjects, and issues, including wedding photography.